How about sending a love gift that would make the beloved partner feel romantic on the special occasion of Valentine’s Day? This can be a wonderful way to add spice to the celebrations. The gift can be retained for years ahead and would make the receiving partner remember the occasion and to feel the warmth of affection of the loving partner as well. Along with the special romantic movies and the dinner dates, even a gift sent directly to the doorstep of the lovers would make the event truly memorable. Table Top With Chocolates Hamper: This gift hamper combines some of the most exciting valentine’s day gifts and makes the girlfriend or wife feel absolutely crazy. 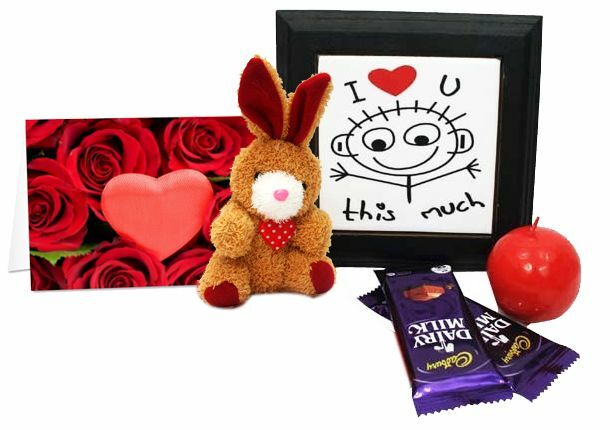 The gift hamper includes a photo frame showing a cute cartoon boy spreading his arms to tell the lovely girl how much he loves her; a beautiful card with the red roses and the pink heart shape printed on it; a cute little teddy bear, scented candle ball in red color and Cadbury’s Dairy Milk chocolate bars. Nail Lacquer With Remover & Cotton Balls: This gift hamper combines the beauty products that add glamor to the nails of the beloved girlfriend or wife. The most fabulous valentines gifts included in this combo are the pair of eye-catching shades of Lakme nail lacquer, a bottle of nail polish remover and some cotton balls to apply the remover as well. This nail beautifying package also has an artificial pink rose as well. 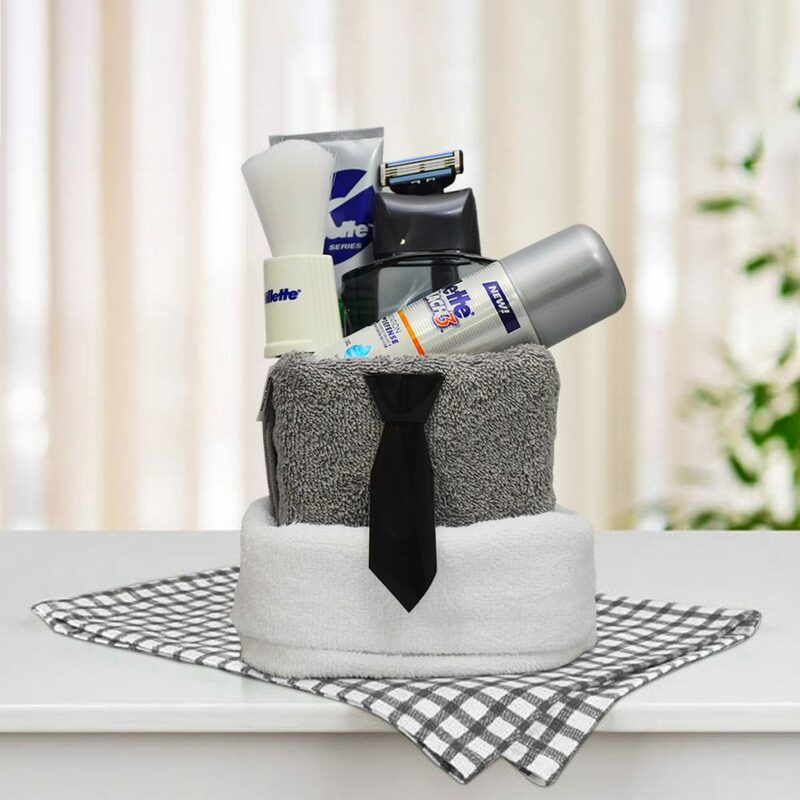 Cosmetic & Tealight Hamper: This is among the most surprising combinations of love gifts as the beauty products included in this combination would express the passion of the handsome guys to watch their girlfriends or wives look gorgeous wearing the eye-catching makeup. The combo includes an eyeliner, lip balm and nail lacquer arranged in a bucket and a pair of scented Tealights that spread the mood for romance when lit in the room. Sip Of Love: This magnificent hamper includes a coffee mug that carries an equation that explains the addition of the partners and the chemistry that results in true love. 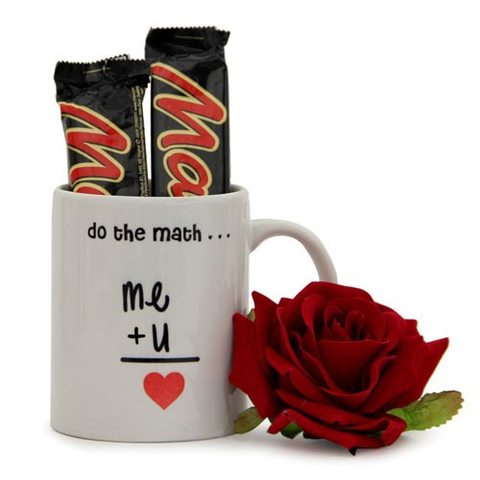 The coffee mug is also accompanied by the artificial red rose and a couple of Mars chocolate bars as well. So, the gift combo would be all set to impress the gorgeous lady on a special occasion. 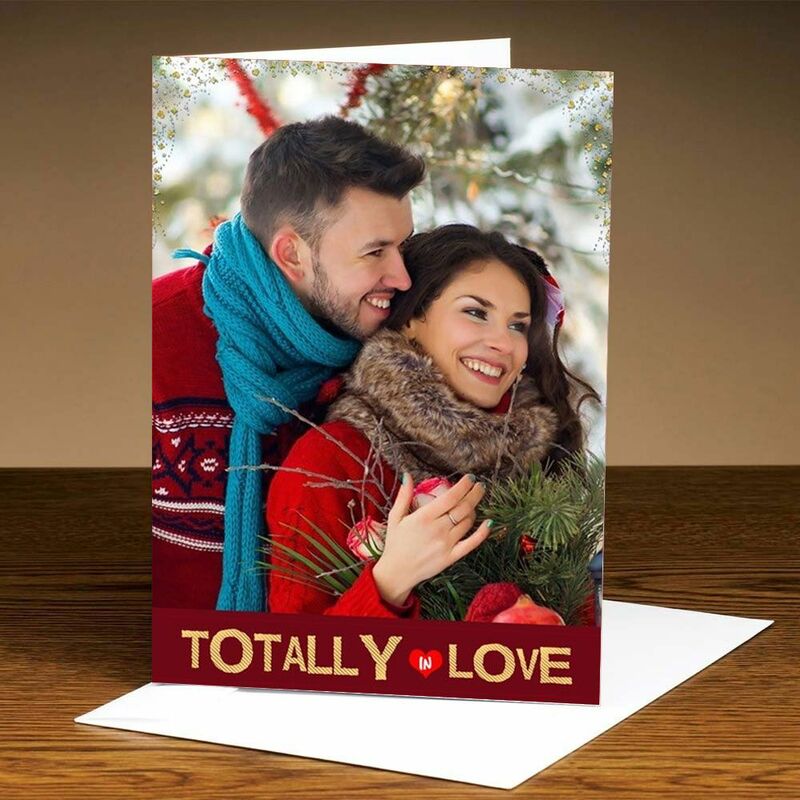 Personalized Totally In Love Glitter Card: This greeting card includes the photograph of the loving couple along with the message that explains the state of mind of the couple that is deeply in love with each other. Along with it, the personalised love message would also be included in the card to make it an exclusively made valentine gift for the loving partner. Giftcart.com is the most exciting online gift shopping platform that brings an array of most wonderful love gifts to greet the valentine. Along with this theme, Giftcart.com would also be the best place to search for different gifts suitable for various occasions as well. The esteemed customers across India would find the catchiest gift ideas at this online shopping portal.